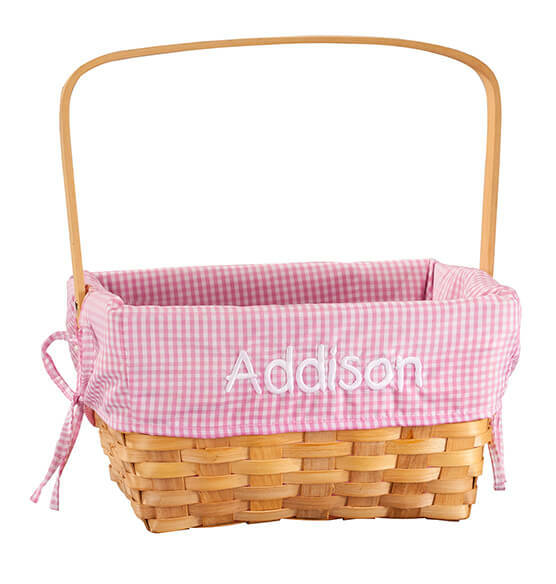 Sweet as the goodies it will hold on Easter morning, this Personalized Pink Gingham Wicker Easter Basket is lined in pretty pink gingham—and personalized for some bunny special! A treasure to enjoy for many holidays to come, the classic wicker Easter basket is crafted of durable chip wood with a 6" high folding handle, making it easy to carry at Easter egg hunts. 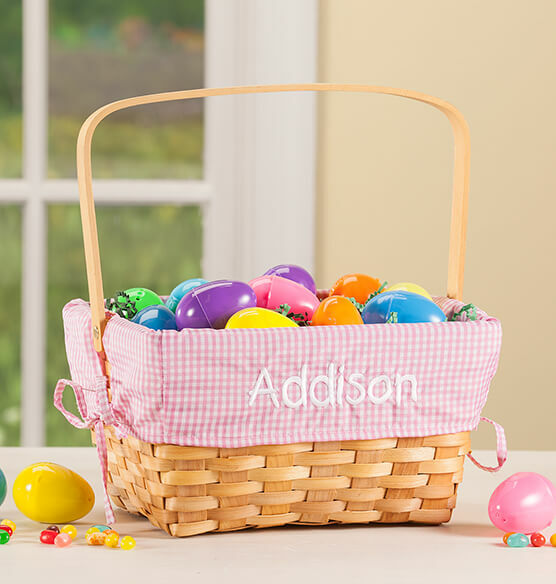 Allowing plenty of room for chocolate bunnies, jelly beans and treats galore, the personalized Easter basket opening is 10" long x 8" high, and basket is 6" high. When Easter is over, this basket also makes a cute, sturdy holder for crayons, markers, sidewalk chalk, small dolls, jump ropes and more. Securing with 2 side ties, the removable pink gingham liner will be custom embroidered with one special name, creating a keepsake treasure. Specify name; limit 1 line, 10 letters/spaces. Liner is polyester; hand wash. Candy and toys not included.